In chemistry, intercalation is the reversible inclusion or insertion of a molecule (or ion) into compounds with layered structures. Examples are found in graphite and transition metal dichalcogenides. 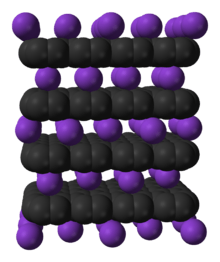 One famous intercalation host is graphite, which intercalates of potassium as a guest. Intercalation expands the van der Waals gap between sheets, which requires energy. Usually this energy is supplied by charge transfer between the guest and the host solid, i.e., redox. Two potassium graphite compounds are KC8 and KC24. Carbon fluorides (e.g., (CF)x and (C4F)) are prepared by reaction of fluorine with graphitic carbon. The color is greyish, white, or yellow. The bond between the carbon and fluorine atoms is covalent, thus fluorine is not intercalated. Such materials have been considered as a cathode in various lithium batteries. Cartoon for intercalation of Li into a titanium disulfide cathode. The process involves swelling of one crystal axis and charge transfer from Li to Ti. Treating graphite with strong acids in the presence of oxidizing agents, causes the graphite to oxidise. Graphite bisulfate, [C24]+[HSO4]−, is prepared by this approach using sulfuric acid and a little nitric acid or chromic acid. The analogous graphite perchlorate can be made similarly by reaction with perchloric acid. Another well-known family of intercalation hosts are the layered metal dichalcogenides such as titanium disulfide. In characteristic manner, intercalation is analyzed by X-ray diffraction, since the spacing between sheets increases, and by electrical conductivity, since charge transfer alters the number of charge carriers. A structurally related species is iron oxychloride. An extreme case of intercalation is the complete separation of the layers of the material. This process is called exfoliation. Typically aggressive conditions are required involving highly polar solvents and aggressive reagents. In biochemistry, intercalation is the insertion of molecules between the bases of DNA. This process is used as a method for analyzing DNA and it is also the basis of certain kinds of poisoning. Clathrates are chemical substances consisting of a lattice that traps or contains molecules. Usually, clathrate compounds are polymeric and completely envelop the guest molecule. Inclusion compounds are often molecules, whereas clathrates are typically polymeric. Intercalation compounds, which are not 3-dimensional, unlike clathrate compounds. According to IUPAC, clathrates are "Inclusion compounds in which the guest molecule is in a cage formed by the host molecule or by a lattice of host molecules." ↑ Stanley M Whittingha (2 December 2012). INTERCALATION CHEMISTRY. Elsevier. ISBN 978-0-323-14040-9. Retrieved 18 May 2016. ↑ W. Müller-Warmuth; R. Schöllhorn (6 December 2012). Progress in Intercalation Research. Physics and Chemistry of Materials with Low-Dimensional Structures 17. Springer Science & Business Media. ISBN 978-94-011-0890-4. Retrieved 18 May 2016. ↑ Holleman, A. F.; Wiberg, E. "Inorganic Chemistry" Academic Press: San Diego, 2001. p. 794 ISBN 0-12-352651-5. ↑ IUPAC, Compendium of Chemical Terminology, 2nd ed. (the "Gold Book") (1997). Online corrected version: (2006–) "clathrates".